School of Art MFA candidates commissioned for large scale sculpture. Their sculpture, titled "Flight," was installed outside Door 3 late last month and marks the completion of the first phase of an outdoor baggage claim sculptural walk at the airport. PIT's Art Advisory Committee selected "Flight," along with three other projects, each receiving a $25,000 stipend and an agreement to loan the work to the airport for up to five years. "The work creates a strong contrast with the blocky black, gray, and red aesthetics of the airport's architecture," Katayama said. "We wanted something that was vibrant and welcoming." 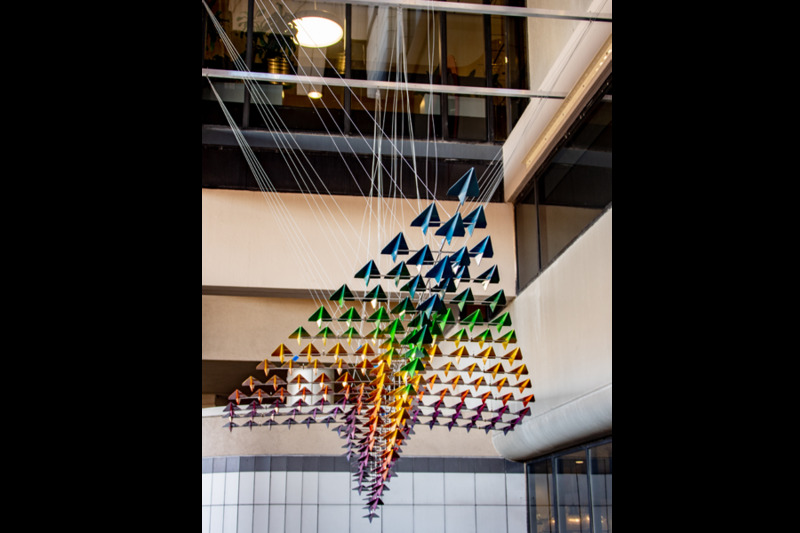 "Flight" is comprised of 225 individual aluminum, painted paper airplanes suspended from a stainless steel armature. To create the work, Katayama and Neumann enlisted the help of several local vendors. Especially instrumental was BASF, who donated $9,000 worth of paint primers, colors, and UV clear coats that are typically used on vehicles including Smart Cars, Nissans, and Subarus, as well as sculptures at Disney World. "By working with local artisans and engineers, "Flight" demonstrates some of the best Pittsburgh has to offer," Neumann said. "Like the sculpture itself — which consists of many small airplanes coming together to create one unified whole — we relied on collaboration and the expertise of several people to help us realize our vision." 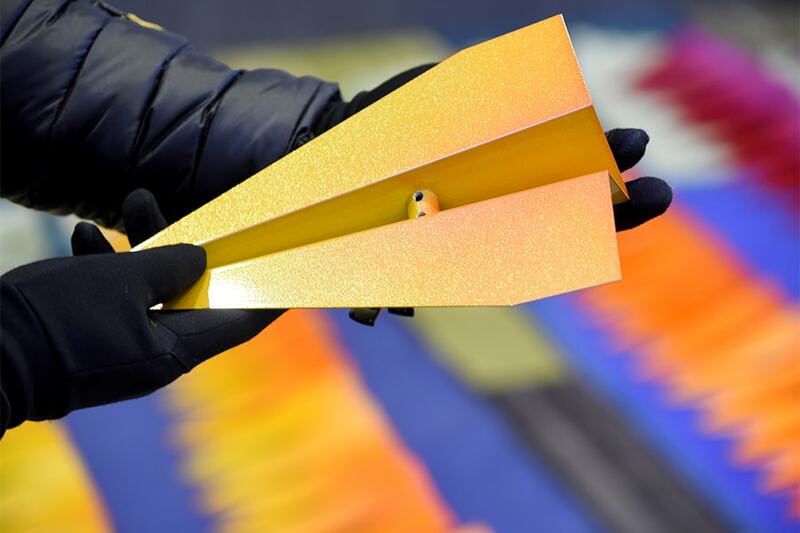 The aluminum paper planes and the armature were fabricated by Technique Architectural Products, and the individual components were painted by Bruce Harvey at Pro Comp Custom. In addition, Katayama and Neumann received guidance from School of Art professors Bob Bingham and Carol Kumata, along with Larry Hayhurst in the College of Engineering's Tech Spark facility. 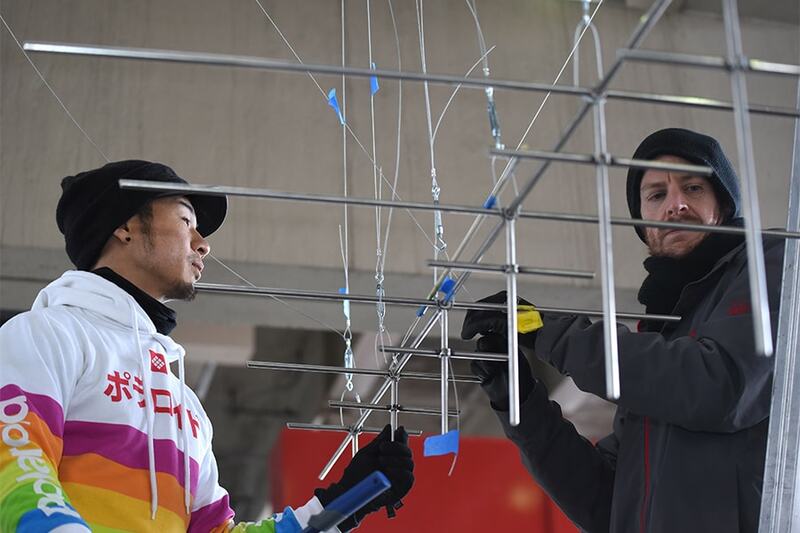 "Mike and Shohei have worked to embody the spirit of an airport with this piece," PIT Arts & Culture Manager Rachel Rearick said. "They have captured a sense of movement that not only depicts flight, but also speaks to the forward trajectory of the arts program at PIT. I was impressed by the way that they approached a complex suspension design, and their attention to detail throughout the entire process has been impeccable." "As 'Flight' was being installed, I saw the sun reflect a sheen of gold flakes off the work and was mesmerized and enchanted," Katayama said. "That was the moment I really felt 'wow, we did something.'" Neumann said, "Seeing people pause for a minute after coming out of the airport to admire the airplane made me feel proud that we came through for the airport, for the people of Pittsburgh."